Julia's Bookbag: Monopoly is an evil game. 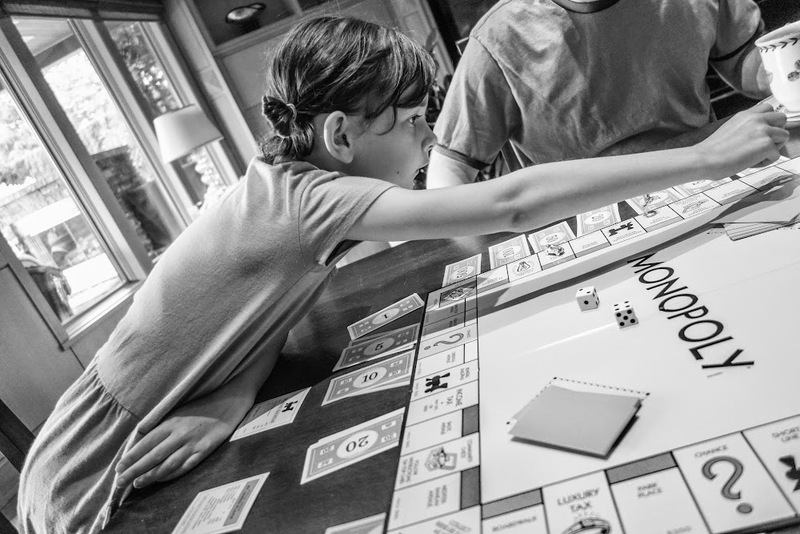 We spent the weekend at my mom and stepdad's house recently, and had our first family game of real Monopoly. Julia, me, Andrew and the g-parents. I haven't played Monopoly in about 20 years, I'm guessing. 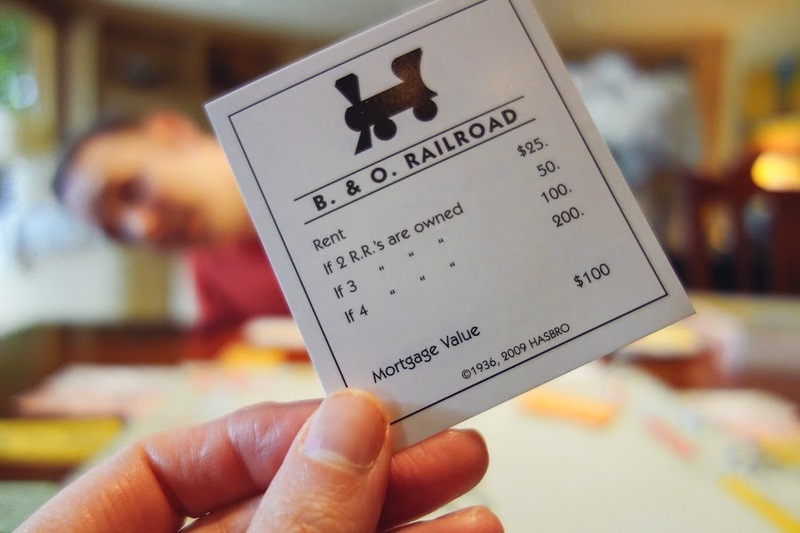 I have many, many thoughts about Monopoly. Not many of them are good. At one point during our game, Andrew looked at me and said, "Wow you get really....intense during this game." Monopoly basically turns me into a crazed caricature of myself, and I'm already a crazed caricature of myself on a GOOD day. 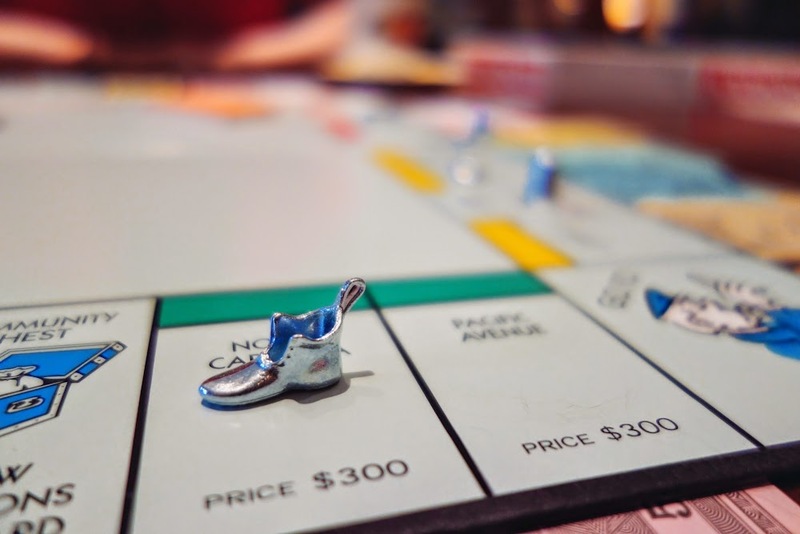 I think Monopoly reveals much of your inner being. My inner being is apparently a black, dark, bottomless void of malevolence. Just sayin'! Happy fun times! I'm not a good winner. And an even worse loser. I'm a terrible role model for my child. I laugh at the misfortune of others. I celebrate my (few) lucky moments to an absurd level. I made my beloved little daughter pay almost $700 in an auction for a piece of property I had no intention of carrying through with a winning bid, just to make it painful for her to get said piece of property. My mother said she was ashamed of me. But I had a good reason! 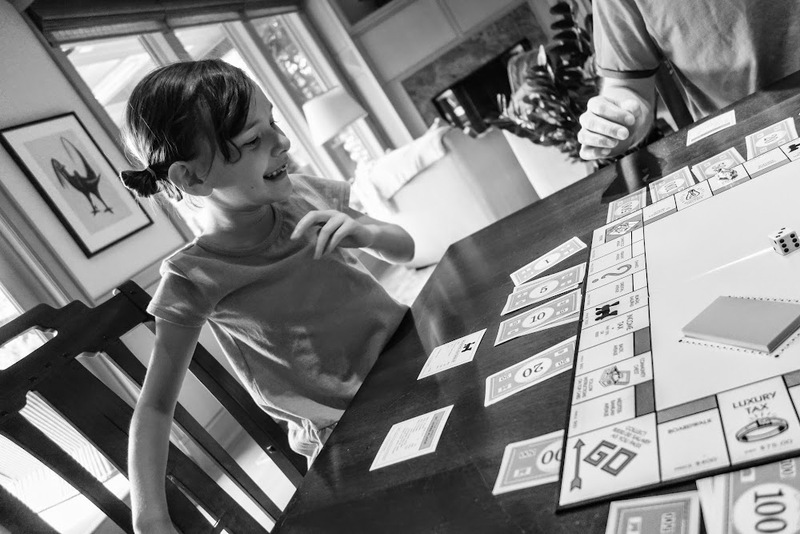 I was trying to prevent Julia from buying Boardwalk (SHE ALREADY HAD PARKPLACE) and having the most expensive monopoly in the game. 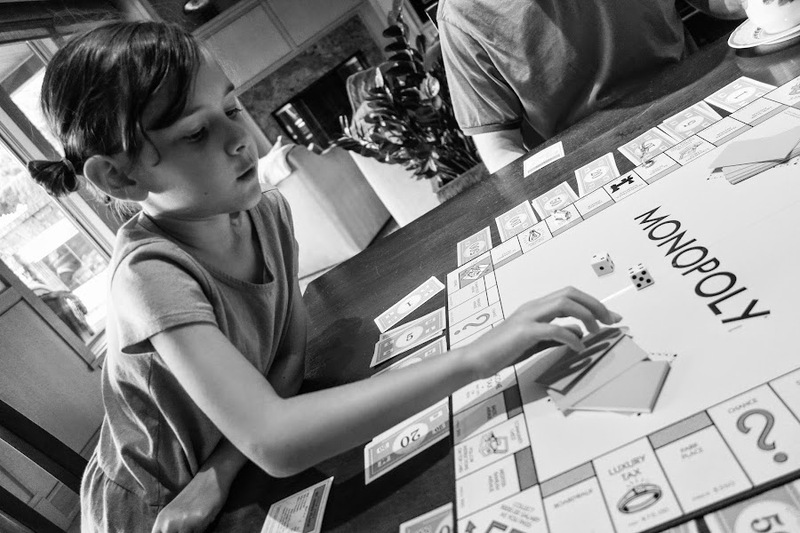 Not only did she get that monopoly, she then BUILT HOTELS on both properties and wiped the floor with the rest of us. Ok guess what? Turns out that my kiddo is the luckiest piece of sunshine in the universe and has crazy crazy good fortune in games. We've seen this time and again in various board games. The kid has really good feng shui, or whatever, but someone seriously needs to TAKE THIS GIRL TO VEGAS. She lands on Free Parking, like, multiple times. (the way we play, everything you have to pay for a Chance or Community Chest card, or to get out of jail, goes into the middle, and if you land on the Free Parking spot, you get whatever pile o' cash is in the middle.) I landed on it once, got a huge pile of cash and still lost. Julia never gets sent to jail. It's all terribly unfair and unjust. 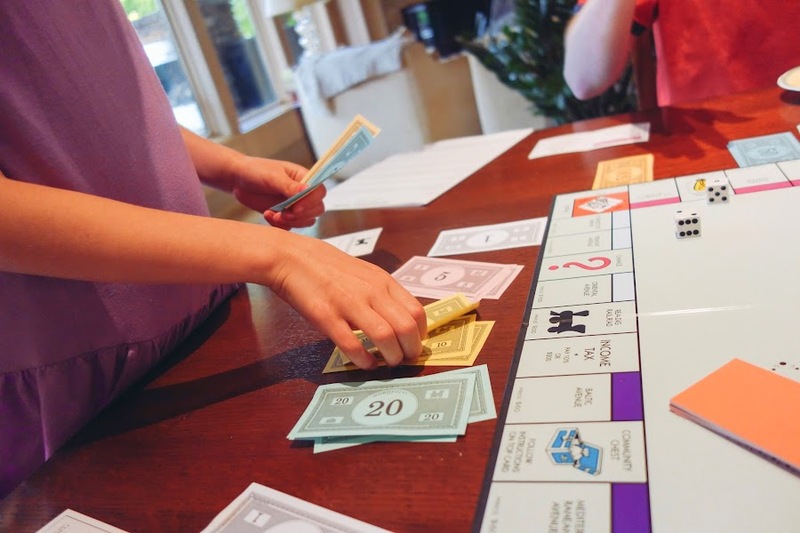 I have many Monopoly strategies, want to hear them? Sometimes I hoard all my money. But then I don't own anything and I end up having to pay it all out on people's houses and hotels. OR, I try and buy everything, and then have no money. 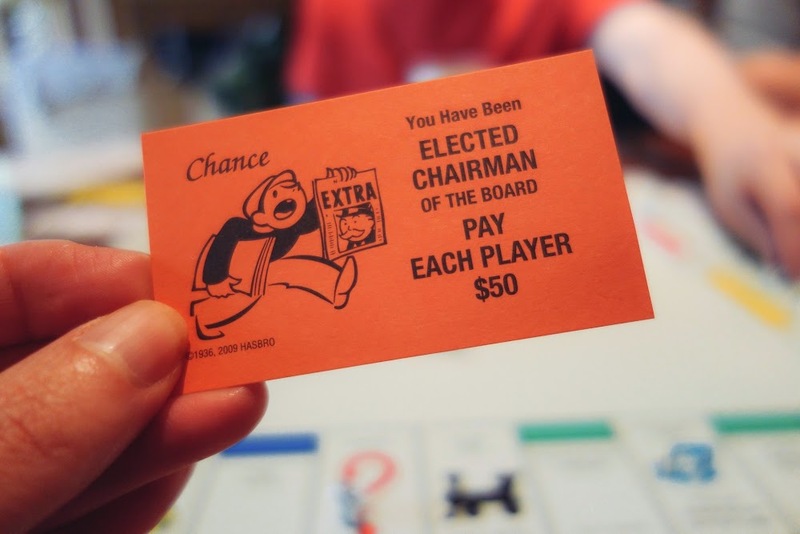 Or I try and buy the cheap properties and build hotels n' stuff on them, but then I still get hammered by certain little girls who BUY BOARDWALK. We played several times this past weekend and I can't figure out how she does it. She winds up with a bunch of property and tons of money. She gets every lucky card there is and doesn't land on any of my houses or hotels. Near the end, I landed on Boardwalk with a hotel on it (that's $4000, yo), and at that point, I had nearly everything I owned mortgaged and I threw up my hands and yelled, I'M OUT! And giggled at the absurdity of losing so spectacularly. My mom lost even worse than I did, if that's possible, she literally lost every penny. My stepdad just shook his head and thanked the universe that my mom and I aren't really out there trying to make money in the real estate market. Someday I'll video my mother and I playing a board game. We're like banshees. There's a lot of yelling and keening and wailing and fake slapping. Sometimes the slapping isn't so fake. I think my poor stepdad got pinched several times. It's all really really fun! Monopoly is my favorite board game! Risk was fun but it took too long (4-5 hours) while a good Monopoly game could last 2 hours and it was ok to end it there. I think Julia will really enjoy Clue! Those were the best board games really! It's raining this whole week, you remind me that I should go ahead and bring the board games out since the kids can't go outside! I've never played Risk! You know what game I used to love? Life. Have you ever played that? I used to love that game. That's going to be the next game I buy. I didn't play Life yet! I have heard of it though and probably should give it a try if you say it's good! Target sometimes have sales on board games btw. I need to get this girl's Chinese astrology chart analyzed or something -- one time we played this game where you get handed either witches or good fairies and I got all the witches (ALL THE TIME) and she got all the fairies. UNFAIR. I totally thought I would win after I got a huge Free Parking pile of money -- my step dad was like GAME CHANGER, but no. I still lost in a huge way. I seriously started getting the chills while reading this. I hate Monopoly. Truly, I do. I don't know why. And of course, Big Sis is now clamoring for it. She likes it. ok you know what I realized? 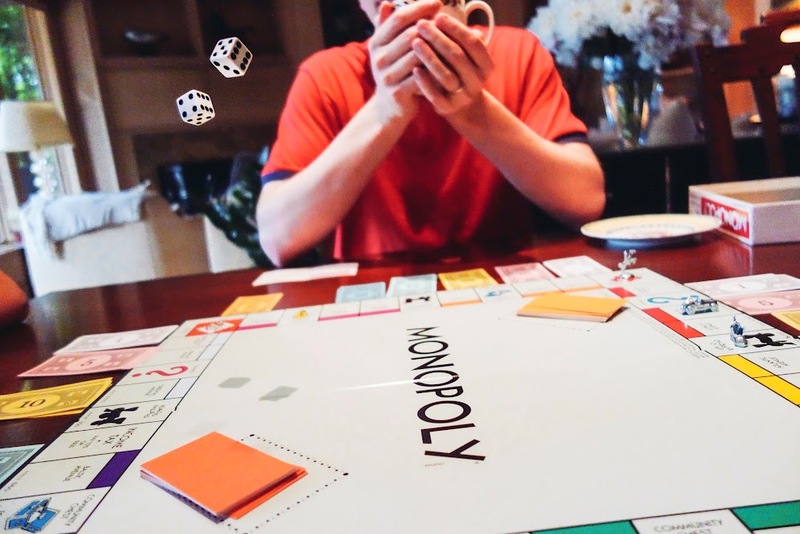 I get ANXIETY playing Monopoly. I also get anxiety playing that game where you have to draw the word and I can't recall the name b/c I have dementia I think. Also, watching me have to count out money and make change was painful. I don't like Monopoly 'cause it gets to me too. I get so invested. It's a hard game for me not to get frustrated with. It's all luck of the draw. I prefer games (like Scrabble) were I earn my loss or win and feel like I stand a chance at improvement. Your games sound fun and that's a video I'd like to see. we do have a fun AND VIOLENT time! heh. I have not seen Bookopoly, that sounds super fun! Monopoly is one of those games that seems like a good idea at the time but always, ALWAYS goes horribly wrong before someone throws the board.